1 tsp of liquid smoke or your favorite bbq sauce (optional) * Add if you want a more smokey flavored sauce. Combine all ingredients in a large saucepan. Bring to a boil. 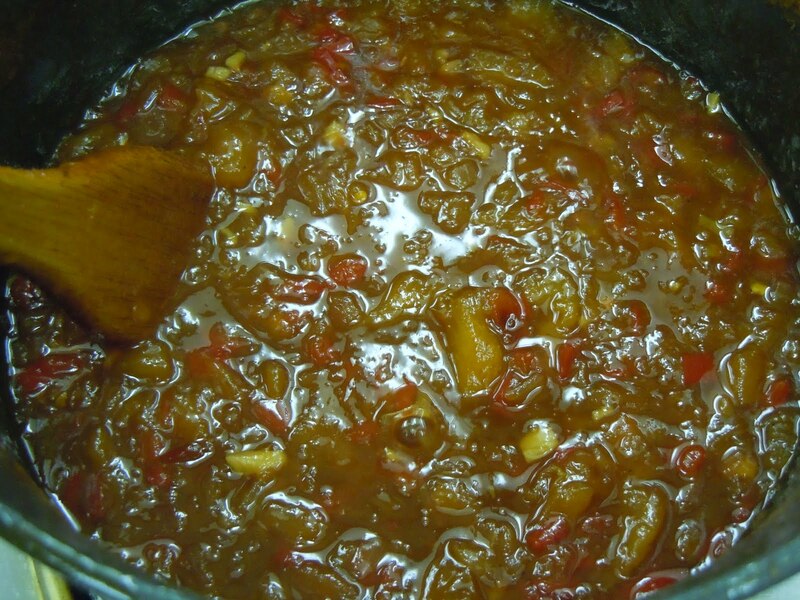 Reduce heat and simmer, stirring frequently, until mixture thickens to the consistency of barbeque sauce, approximately 35 minutes or until thick enough to spread on chicken or steak. If you prefer a less chunky sauce, place mixture in blender and puree until smooth Refrigerate for up to a week of place in an airtight container in freezer. To thicken, place in a saucepan and cook over medium heat until sauce reaches desired consistency. Think Voodoo Doughnuts Bacon Maple Bars except with chocolate! 1. Preheat oven to 350°F. Generously butter and flour (or use cupcake liners) two 12-cupcake pans and set aside. Place cocoa powder in a large bowl; gradually add boiling water, whisking until thoroughly combined. Set aside to cool. 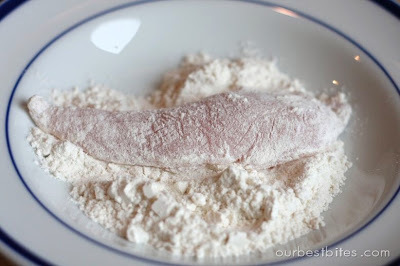 In a medium bowl sift together flour, baking soda, baking powder, and salt. Finely chop whole vanilla beans (or process in food processor until fine). 2. In a large mixing bowl beat butter, sugar, vanilla beans, and pure vanilla on medium-high until well combined. Beat in eggs, one by one, until light and fluffy, about 5 minutes, scraping down sides of bowl often. Add the sifted dry ingredients in fourths, alternating with cocoa liquid. Stir slowly to prevent splatter. Scrape sides of bowl. Beat on low about 3 minutes or just until combined. Pour batter into prepared baking pans, filling each about two-thirds full. Bake until the center is just barely set about 25-30 minutes (depends on your oven). Be careful not to over-bake; cake should slightly resist the pressure of your finger. Let cupcakes rest for 10 minutes, then remove from pans. 3. Meanwhile, in a large skillet cook bacon until crisp. Reserve 1 tablespoon bacon drippings to use in Chocolate Frosting, if desired. Drain bacon on paper towels. Finely chop enough bacon to equal 1/3 cup. Set aside. 4. For the Chocolate Frosting, chop chocolate and place in a large bowl. In a small saucepan, bring 1 1/2 cups of the whipping cream just to boiling; pour over chocolate then add bacon drippings. Whisk until smooth. Add remaining 1/2 cup cold cream; whisk to combine. Place in freezer for 30 minutes, whisking occasionally until spreadable. (Watch closely the last 10 minutes; frosting should remain glossy.) Stir the chopped cooked bacon into the frosting. Set aside. 5. Frost cupcakes with Chocolate Frosting. If you use a piping bag with a very large tip you will be able to get a more even amount on each cupcake. Refrigerate. Before serving, let cupcakes stand at room temperature for 30 minutes. 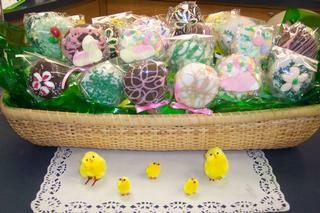 It was great day at Arleta's Library Bakery Cafe! What a beautiful sunny morning to go out to breakfast with some wonderful ladies. We decided to beat the rush and get there when the doors opened at 8:30. By 8:25 there were already 15 people waiting in line. The space is very small, but cozy. We were greeted by warm smiles and quickly seated. Many of us had already looked over the menu, so it didn't take long to decide what we wanted. From our table I could see a waitress cutting into a pan of freshly baked blackberry coffee cake...it looked divine! Did I forget to mention that they make all of their own baked goods? The ladies were served their "Stump Town" coffee as we chatted away the time waiting for our delicious breakfasts to be prepared. After taking my first bite, my taste buds were bombarded with a mixture of savory and sweet flavors. The gravy was perfect...not too salty or greasy. The library fries were a nice change from the normal hash browns that are normally served at breakfast. And to add just a little more deliciousness to our meal, our server brought us some of their homemade ketchup and strawberry jam...yum! The zesty homemade ketchup was a perfect match to these perfectly seasoned potatoes. I didn't have any of the jam, but all the ladies agreed that it was wonderful! As we passed around samples of our breakfasts, I had a bite of the spicy Italian sausage that was blended with just the right amount of Italian herbs to give it a nice kick! I also had some of the batter dipped brioche that was griddle fried and served with whipped honey butter and maple syrup. I have to say that it was so good that it didn't need the maple syrup. I used it to catch the last remnants of the rosemary sausage gravy from my plate. Delicious! Arleta's is a great place for breakfast. It has a casual, relaxed, homey feel. Like going to grandma's house....right down to the Corelle yellow patterned dinner plates and coffee cups. The company was great, the prices are reasonable, food was delicious, service is friendly and courteous...what else could you ask for? Two thumbs up! Waffles: Crack the eggs into a medium baking dish and whisk lightly. Add the milk, sugar, vanilla and salt and whisk until smooth. Press down on bread slices to flatten slightly. 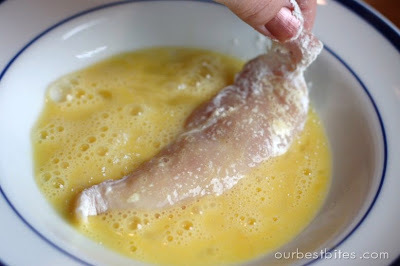 Soak the bread in the egg mixture until completely soaked through, about 4 to 5 minutes per side. Heat a square 4 slot waffle maker and coat with nonstick spray or melted butter. 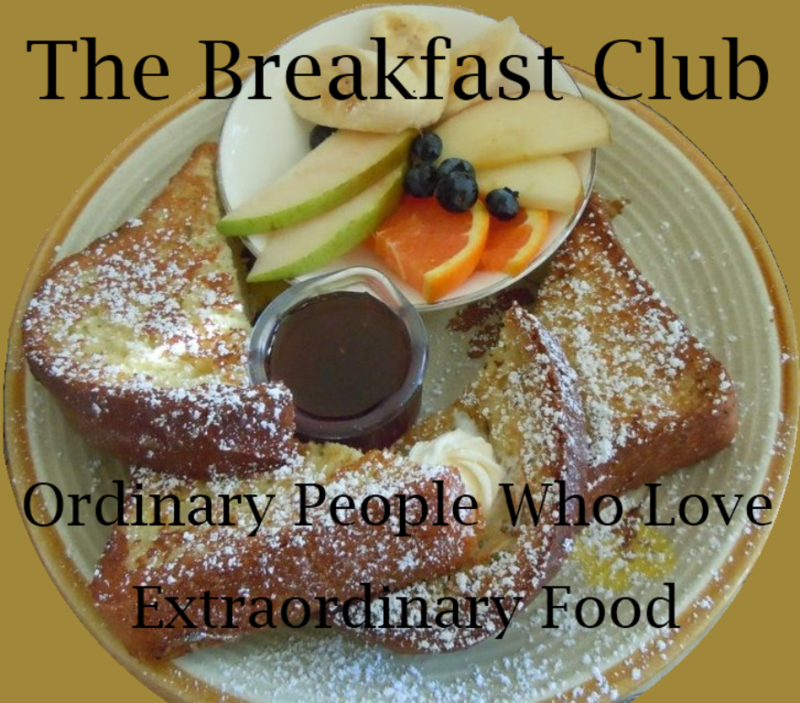 Remove the French toast from the eggs using a slotted spatula, allowing excess egg mixture to drip off. Make 2 at a time and press down gently at first, then add a little pressure to the cover and press until the cover is completely closed. Cook until golden brown, about 3 minutes. Repeat with the remaining 6. Carefully remove each French toast waffle to a plate. Cover each waffle with peanut butter. Dust with confectioners' sugar and drizzle with some of the mixed berry syrup. Garnish with fresh mixed berries, berry syrup, banana slices and mint sprig. Combine the strawberries, blackberries, raspberries, sugar and 1/4 cup water in a medium saucepan, bring to boil and cook, stirring occasionally, until the berries are soft, about 10 minutes. Remove from the heat and let cool for 5 minutes. Transfer the berry mixture to a blender or food processor, add the raspberry preserves and lemon juice and blend until smooth. Transfer to a bowl and let cool to room temperature. * You can use the leftover as a topping for ice cream or blend with other ingredients for a smoothie. 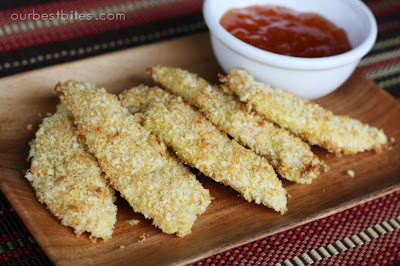 Combine it with Panko and spices in a shallow dish. Mix well to distribute all of the spices. Place the flour in another shallow dish, and the egg in another. Give the egg a quick beating. And then finally coat in the coconut Panko mixture. Press in with your fingers to make sure the entire thing is well coated. 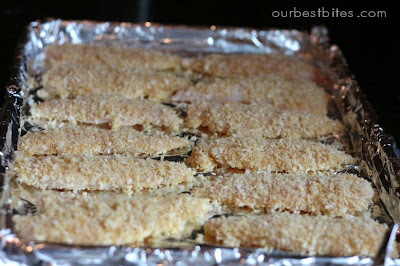 Place chicken tenders on a foil-lined baking sheet (for easy clean up!) that has been sprayed with non-stick cooking spray. I give mine a teeny drizzle of olive oil on top to help them crisp nicely, but it’s optional. 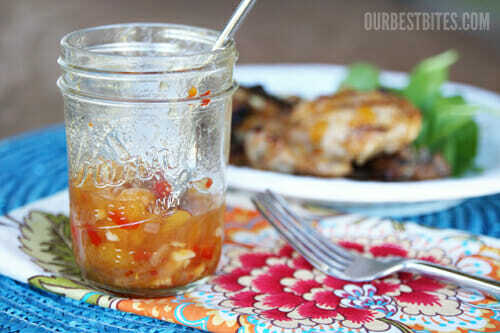 You can make this to keep in the fridge without going to the trouble of canning as well! Recipe from Ball*Makes 3 half pint jars. 1. Prepare boiling water canner (as in, fill up your big pot with water) . Heat jars and lids in simmering water until ready for use (I put my jars through the “sanitize” setting on my dishwasher and place the lids in a pot of simmering water). Do not boil. Set bands aside. 2. Combine all ingredients in a large saucepan. Bring to a boil. 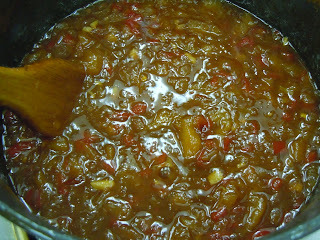 Reduce heat and simmer, stirring frequently, until mixture thickens to the consistency of a thin commercial barbeque sauce, about 25 minutes. 4. Process in boiling water for 15 minutes, adjusting for altitude*. Remove jars and cool. Check lids for seal after 24 hours. Lid should not flex up adn down when center is pressed. *Recipe as written is for altitudes 0-1000 ft above sea level. Increase processing time for amount given for each altitude: For 1,001-3,000 ft: add 5 minutes. 3,001-6,000: add 10 minutes. 6,001-8,000: add 15 minutes. 8,001-10,000: add 20 minutes. Serve over chicken, fish, or pork, or as a spread on turkey or chicken burgers or a dip for Crispy Coconut Chicken Fingers. Remember to use the $2 off coupons in your Payback Books and discounted coupons in your Entertainment Books for any showtime over $8.00...there are also these coupons for Regal Cinemas. What is the greatest self help book ever written? One of my favorite past times is visiting the local bookstore. I enjoy checking out all the new books and seeing the hot topic of the day. You can tell a lot about our culture by the popular at Barnes & Noble or Borders. I am most amazed at all the self help books that are popular. Do you know what I mean by self help? These are the books written by different people who have some advice or ten-step program to make our lives better. It seems quite superficial, but these are the most popular kinds of books! Most of the authors have their faces on the front of the book, smiling real big, revealing to all of us, “Just do what I tell you to do and your life can be like mine!” Next time you are in a book store just check the self help section out. It is quite the experience! I don’t want to write off people who are trying to give wisdom and help others - many people have a lot of good things to say and good advice to give - but I wonder if there is more, if there is a better book to help others. So often we look to professionals, motivational speakers, or politicians to see what we need to do in our lives. We often forget about one book that has all the answers. I wonder if a new edition of the Bible came out tomorrow in the book stores that had an attractive picture of Jesus on it, looking like He is the next best thing in self helps books. It’s not going to happen, but what will it take for us to realize what the Word of God in the Bible is truly about? The Holy Scriptures is the first and best self help book ever written! My friends, if you’re looking for a story, advice, or anointed words to give you direction and inspire your life, the Bible is what you are looking for. If you are looking for words to pray because you can’t come up with your own, the psalms in the Bible are ancient prayers of those who desired to reach God. If you are looking for evidence of God’s healing love when you are sick, the Bible is full of men and women receiving the healing miracles of Jesus. If you want to read about God’s mercy and forgiveness, the Gospels are full of Jesus bringing mercy to the disciples and people of his time. If you want better friendships turn to the story David and Jonathan in the book of Kings and see their depth of friendship. If you want to find your call in life, turn to the Acts of the Apostles and Paul’s letters to see how he responds to Jesus’ call for him to save the Gentiles. Most importantly if you are looking for a role model, turn to the Gospels to learn about our Lord and Savior Jesus Christ and how He gave His life for us on the cross. If you hopeless, turn to the resurrection of Jesus and have faith in Him! What a great book! There are so many stores that can truly change our lives, only if we let them. Maybe it is time to pick up the Word of God and put those other books aside. Dive into the words and stories that the Lord has given us to guide us and teach us about what life is truly about. And if you want to, put a picture of Jesus on the front, you know…to fit in with all the rest of the self help books. * Rusty is a seminarian at St. Gregory the Great Seminary in Seward, Nebraska and is the co-founder of Live Greater Ministries. Check out Northwest Sweets on NW 23rd..you won't be sorry! 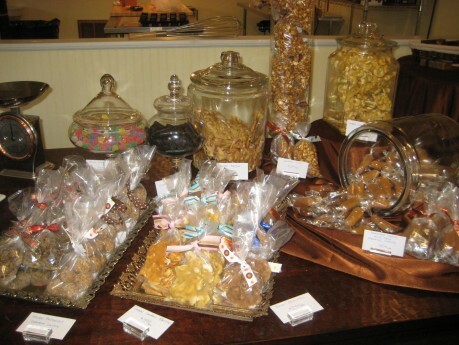 Get a major sugar high at Steve Gazda’s Northwest sweets. Ever since the beginning of the year, I’ve heard one resolution after another about “avoiding sugar.” But if you’re waiting for an excuse to stray from your commitment, check out Northwest Sweets. The candy shop opened at the end of 2009 on Northwest 23rd Avenue, offering old-timey treats—taffy, jawbreakers, lemon drops, Squirrel Nut Zippers, wax soda bottles and retro chewing gum like Clove and Blackjack—and a haute shot of Nob Hill panache with a variety of housemade, artisan goodies. Confectioner/owner Steve Gazda’s sugar cred can be traced to a stint as pastry chef de partie at the Four Seasons in Atlanta, as well as local pastry- and confection-teaching gigs. These days he can be found in his kitchen/workshop right smack in the middle of the store concocting handmade English toffees, caramels, pâtes de fruits (think gussied-up Sunkist Fruit Gems), pistachio nougat, coconut snowballs and sugar plums, plus chocolate truffles bearing unexpected essences like masala spice and chestnut honey. His unique take on the now-ubiquitous handmade marshmallow resembles giant dollops of whipped cream, sized to span the entire surface area of a mug of hot cocoa. During our recent visit to the shop, Gazda was at work perfecting soon-to-be-available bacon-chipotle and pineapple-chipotle caramel sauces, as well as a positively addictive bacon butter-crunch toffee (which, I can attest, supports the argument that bacon has not yet jumped the shark). Sweeeet. Order this: Dark-chocolate pecan turtle ($3.50) is the best meal-replacement bar you could ever ask for. Best deal: Colored sugar dots on strips of white paper (25 cents a foot!) and housemade buttery caramels (50 cents). I’ll pass: Brittles are texturally challenged and likely to extract a filling ($3.50). EAT: Northwest Sweets, 740 NW 23rd Ave., 360-1350. 11 am-7 pm Wednesday-Monday. $ Inexpensive. Check nwsweets.com for news of future candy-making classes. Here’s a crazy-good deal: The Observatory (8115 SE Stark St., 445-6284, theobservatorypdx.com) will sell you a good eight ounces of creamy pâté, with crackers, bread and a lot of good mustard—enough to make a satisfying appetizer for a half-dozen. The best fried meat in town is at Red Onion (1123 NW 23rd Ave., 208-2634): little deep-fried party favors of moist chicken wrapped in padunus leaf with brown-sugar fish sauce dip. Sometimes good things come in plastic containers. The Curry Rice at Bonnie’s Burger (1111 NW 21st Ave., 224-8438), a Northwest Portland institution that serves burgers and teriyaki chicken out of what both looks and feels like a gas station convenience store, is a hearty, stick-to-your-guts stew that serves two normal appetites or one really hungry lumberjack. This filling starch bomb from ¿Por Qué No? (4635 SE Hawthorne Blvd., 954-3138, porquenotacos.com) has beans, rice, sour cream, salsa, guacamole, your choice of meat or just veggies, queso fresco and a choice of either freshly made chips or three tortillas. Sweet, sweet goodness. The crisp yet tender chicken wings at Mee Sen (3924 N Mississippi Ave., 445-1909, meesenpdx.com) are shellacked in sweet, hot sauce and frizzled basil bits. The fatty fish James King serves at The Frying Scotsman (2219 NW Raleigh St., 706-3841, thefryingscotsmanpdx.com) is just as good as the stuff you’d find on the street in Glasgow. Actually, it’s better; King fries everything to order, so there’s no heat lamp involved. A Japanese bistro/dive bar, Tanuki (413 NW 21st Ave., 241-7667), makes a mean bowl of bacon, oysters and soft tofu stewed in kimchi broth with sticky rice. The crunchy hot wings at Portland’s only native wing joint, Fire on the Mountain (1706 E Burnside St. 230-9464, portlandwings.com). Get them with bourbon-chipotle sauce. A Red Hot Chicago hotdog with a big scoop of scalding hot chili from The Fried Onion (SE 3rd and Alder, 961-2534, thefriedonion.com). Throw on some cheese and onions at no extra charge for a real heartburn special...yikes! This hulking two-mealer from La Sirenita (2817 NE Alberta St., 335-8283) is not for the faint of heart, but oh, is it good. Pick a meat to be rolled up with rice, pico de gallo, the eggy crunch of petite rellenos and refried beans that in some indescribable way are responsible for the alchemy that occurs inside the tortilla. The only purple Okinawan sweet-potato pie in town, served at Ohana Hawaiian Cafe (6320 NE Sandy Blvd., 335-5800, ohanahawaiiancafe.com), tastes like a cross between pumpkin and coconut cream pies—only stranger, colder and better. Favorite happy hour by far is at Carafe (200 SW Market St., 248-0004, carafebistro.com), where the wonderful bistro’s burger—a juicy fist of beef on a mayonnaise-slathered mini ciabatta from Ken’s Artisan Bakery—costs less than a Colossal Cheeseburger Basket at Burgerville. Of the few really excellent New Mexico-style breakfast burritos in town, the one at Meat Cheese Bread (1406 SE Stark St., 234-1700, meatcheesebread.com). Subbing hashbrowns for the traditional cubed potatoes is genius. You think you’re hungry, huh? Try downing three fluffy pancakes, each as big as the plate on which they rest, from Stepping Stone Cafe (2390 NW Quimby St., 222-1132, steppingstonecafe.com). Guessing a stack is around 1,500 calories of flour, butter and egg. Are you (wo)man enough? The best doughnut shop in town is Delicious Donuts (12 SE Grand Ave., 233-1833), and you can get half a dozen of their truly delicious doughnuts for a fistful of quarters. Try the blueberry! Baker Adam Kennedy has a new line of pastries under the name “Broken Frame” available at Coffeehouse NW (1951 W Burnside St., 248-2133, coffeehousenorthwest.com). But his best treat isn’t sweet; it’s just prosciutto, butter and salt on a baguette. It’s exquisite. 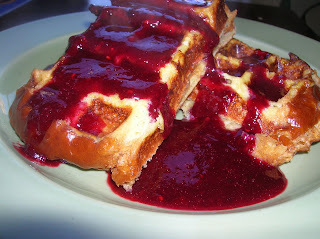 A bacon, Brie and basil delight from The Waffle Window (3610 SE Hawthorne Blvd., 239-4756, wafflewindow.com). Add a fresh cran-apple cider for another two bucks. Those Brie slabs are like three-quarters of an inch thick. It’s not the best banh mi around, but Pho Sam (Southwest 9th Avenue and Alder Street) definitely serves the best one you’ll find downtown. The juicy, sweetly smoky birds at El Inka (48 NE Division St., Gresham, 491-0323), spiced with a secret rub and slowly cooked in the dining room’s brick oven, are freakishly good. Why would anyone order chili cheese fries at El Burrito Loco (3126 NE 82nd Ave., 252-1343)? Because, instead of standard chili, these fries are slathered in smoky, spicy red enchilada sauce. They’re then dusted in cheese and melted into a heart-stopping delight. We love dumplings, and these are tops. Best Taste (8350 SE Division St., Suite 102, 771-0812) mixes in a healthy amount of mushroom with the pork in these wonderful steamed bits of meat, lending them a pleasing gamyness. The best of these Central American tortillas in the metro area are sold at La Guanaquita (2401 NE Cornell Road, Suite P, Hillsboro, 844-6884). They’re freshly made and ungreasy with well-seasoned fillings and flavorful cheese (minimum order of two). A finalist for Portland’s best taco, El Burrito Loco’s (3126 NE 82nd Ave., 252-1343) signature model is a portrait of simplicity: a pair of corn tortillas laden with shredded beef, onion, cilantro and a dash of ruddy chile sauce. These petite beauties will have you jonesin’ like the junkies skulking along the street outside. And at just $1.25 each, El Loco tacos make for an affordable addiction. Brand-new Nob Hill candy shop Northwest Sweets (740 NW 23rd Ave., 360-1350) makes amazing, chewy caramels the size of a baby’s fist. Incredibly cute and easy to make treats for all seasons made with Oreo Double Stuff cookies! All you need are a few ingredients and your creativity! First, take a popsicle stick and gently stuck it into the middle (cream) part of the Oreo. This is to help with dipping the cookie into the candy melts. You don’t need to stick it in all the way though because it might split the Oreo in half, so be a little bit careful. You melt the candy melts according to the directions on the bag. It only takes a little bit of time in the microwave and you’re good to go. Gently dip the cookie into the melted candy until covered completely. Carefully tap the toothpick on the side of the bowl to let the excess candy drip off of the cookie. While the candy is still wet, break the pretzel sticks into small pieces (roughly 1 inch pieces) and stick onto the top of the dipped Oreo. Stick the dipped cookies into a piece of styrofoam to let them dry completely. To create the little leaves use scissors to cut the Airheads into small pieces, then pinch and round the sides with fingers to make them into more of a leaf shape. I used a dab of melted candy to stick the leaves on the tops of the “apples” right next to the pretzel stem. Let everything dry completely. It takes less than 30 minutes to dry, or you can put them in the fridge to speed up the process. 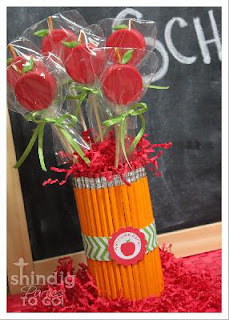 Step six: Use lollipop bags to cover cookie pops and tie with a decorative matching ribbon. These pops don’t have to be perfect—to me when they look somewhat homemade it gives them character! 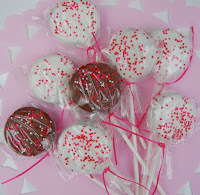 You can make any of the above cookie pops by changing the color of the candy melts and using a variety of different sprinkles and colored frostings. Combine the vinegar, water, agave nectar, lime juice, and salt in a small saucepan over medium heat and bring to a gentle boil. Cook until the liquid is clear and slightly thickened, about 2 minutes. This should yield 1/4 cup of liquid. Refrigerate the dressing for 15 minutes. Quarter the cucumber lengthwise, remove the seeds, and slice crosswise into 1/2 inch pieces. 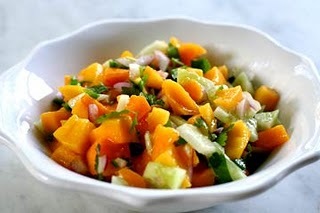 Combine the cucumber, jicama, mango, (cilantro and shrimp-optional), and the cooled vinegar mixture in a bowl and stir well. On a trip to Seattle this weekend, a group of us went to Tutta Bella for lunch. It was quite the dining adventure since I had yet to try a "real" Neapolitan pizza with fresh figs and rosemary lemonade. At first I was a bit skeptical, but after the first taste of my lemonade and bite of pizza I was hooked! One of the three delicious pizzas we had. Who knew that fresh figs on pizza would taste so good. It's one of their seasonal pizzas. Sweet figs and salty savory meats definitely work in this combination! In a medium saucepan, combine the rosemary sprigs, sugar, and water, and bring to a simmer. Let cook for about 10 minutes until slightly thickened and well-infused. Remove from heat and strain. Discard rosemary sprigs. Let cool before using. In a large pitcher, combine cooled syrup, peach nectar, peach slices, and lemon juice ice cubes. Add enough water (1 1/2 cups) to top off, leaving room for additional ice cubes to serve. Add more ice right before serving. Serve a fresh rosemary sprig in each glass. 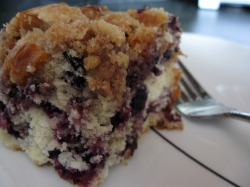 A ﻿delicious way to use up some of those ripe summer blueberries! Spray a 9 by 9-inch glass baking dish with nonstick spray and set aside. In a medium mixing bowl whisk together the flour, baking powder, salt and ground ginger. Set aside. In the bowl of a stand mixer, with the paddle attachment, beat together the butter and sugar on medium speed until light and fluffy, approximately 1 minute. Add the egg and beat until well incorporated, approximately 30 seconds. Add 1/3 of the flour mixture and beat on low speed just until incorporated and then add 1/3 of the milk and beat until incorporated. Repeat, alternating flour and milk until everything has combined. Gently stir in the blueberries and pour the mixture into the prepared baking dish. In a small bowl combine the sugar, flour and nutmeg. Add the butter and work into the dry ingredients using a fork to combine. Continue until the mixture has a crumb-like texture. Sprinkle the mixture on top of the cake. Bake on the middle rack of the oven for 35 minutes or until golden in color. Cool for at least 10 minutes before serving. Captain Dan's Pirate Pastry Shop and Pirate Dan's Beefy Captain Cookies Recipe...A great family owned bakery in Lincoln City, Oregon that you just have to try! A great family owned little bakery at the end of town...blink and you will miss it! The owners are dressed in pirate gear and if you are lucky... Captain Dan will come out in his full gear. Your kids will love it and if they are really, really good they might even get your picture taken with "The Captain" himself...lol. They have great cookies, cakes, and other desserts. Stop by after you have lunch at Mo's and head out onto the beach! I put together a recipe that comes pretty close. Enjoy! 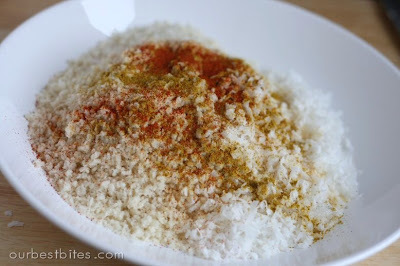 Mix wet ingredients into dry ingredients. Use the back of a large spoon to work it all together. You may even need to use your hands to get everything incorporated. Then roll the cookie dough into 1 1/2 inch balls, place on a parchment covered baking sheet and bake for about 10 minutes in a preheated 350 degree oven. Makes approximately 2 dozen cookies. A lighter and much healthier version of this seafood favorite....with lower sodium and much lower fat! Directions: Mix all ingredients together and form 8 equal size crab cakes. Refrigerate for 1 hour. Add 1/2 teaspoon oil in a nonstick pan and heat on medium heat. Cook 4 crab cakes at a time. Place on a paper towel lined baking sheet. 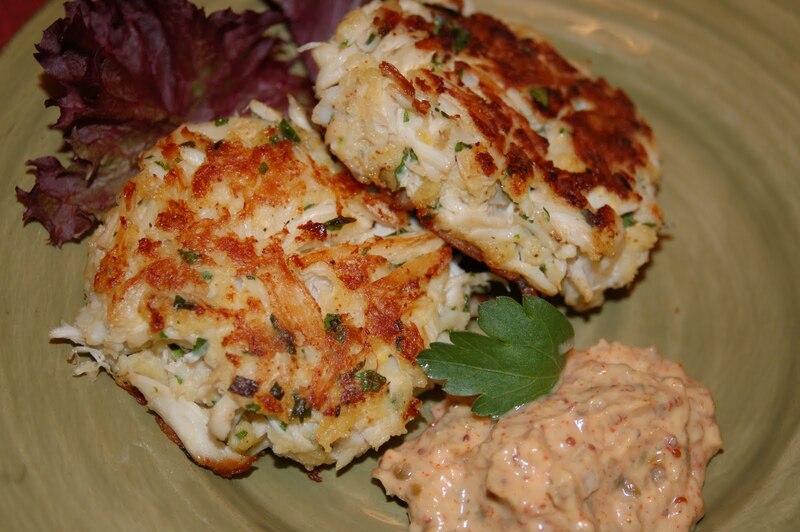 Place crab cakes in a warm oven until ready to serve. To prepare rémoulade, combine 1/4 cup mayonnaise and remaining ingredients in a small bowl; stir with a whisk. Serve with crab cakes. To make shrimp cakes: Place 1 1/2 cups of the breadcrumbs on a flat plate.In a bowl, mix shrimp, mayonnaise, eggs, bell pepper, scallions, garlic paste, mustard, pepper, salt, and the remaining 1/2 cup breadcrumbs until combined. Use a 1/2⅓-cup measure to scoop shrimp mixture and make a shrimp cake. (Mixture will be wet.) Turn out cake onto plate of breadcrumbs; coat completely. Make 7 more cakes with the remaining shrimp mixture and transfer them with a flat metal spatula to a baking sheet lined with waxed paper; flatten cakes slightly, to a 3½-inch circumference. Refrigerate 1 hour. In a large nonstick skillet, heat 2 tablespoons of the oil over medium heat. Add 4 cakes and cook, about 4 minutes per side, until crisp and browned. 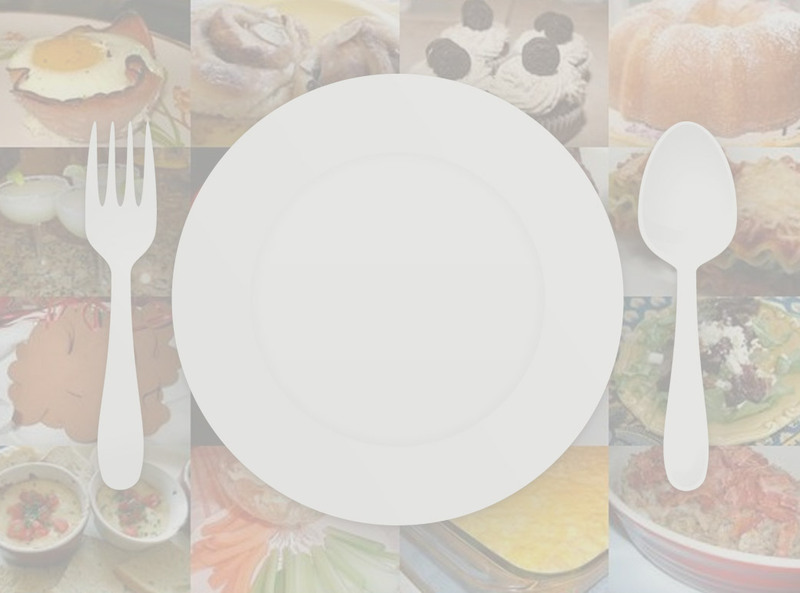 Transfer to a plate; loosely cover with foil to keep warm or place on a baking sheet lined with nonstick foil and keep warm in a 200 degree oven. Repeat with the remaining 2 tablespoons oil and 4 cakes. 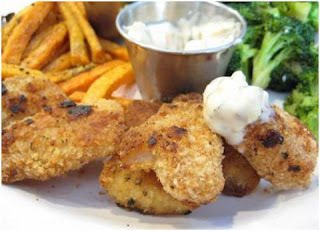 Serve shrimp cakes with tartar sauce.To make tartar sauce:Whisk all ingredients in medium bowl to blend. Season with salt and pepper. Cover; chill at least 1 hour and up to 2 days. 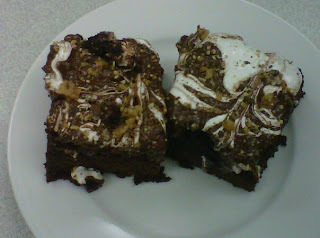 Super Simple Rocky Road Brownies...your kids will love making these with you! This was one of Hanna's favorite recipes to make with me when she was little because she could do about 80% of it on her own. Kids love to bake and this is a yummy and fun one to do together! Bake 1- 13x9 " pan of brownies (double recipe so they are thick and cakey and add 1-2 extra eggs), cool for approximately 10 minutes. Make 2 cups of chocolate frosting and add mini chocolate chips. Set aside. Spread one container of marshmallow cream over brownies while they are still warm. Slightly melt frosting in microwave for approximately 20-30 seconds, stir and drizzle over marshmallow cream, run a butter knife gently through marshmallow and frosting mixture down one side and up the other to swirl the two together. Sprinkle with chopped walnuts and toffee bars. If you place in the refrigerator for a few hours it will allow the brownies to be really dense and yummy and will make it a lot easier to cut apart. Happy baking! 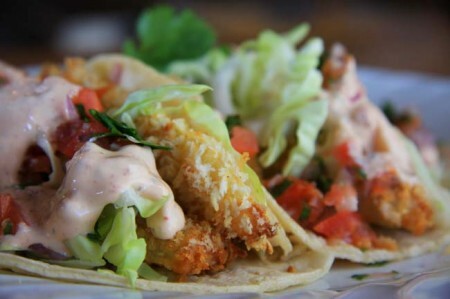 Looking for a fresh and tasty meal for those summer days on the patio...try making crispy fish tacos! You can prep most of the recipe ahead of time to save time. Happy eating! 1. 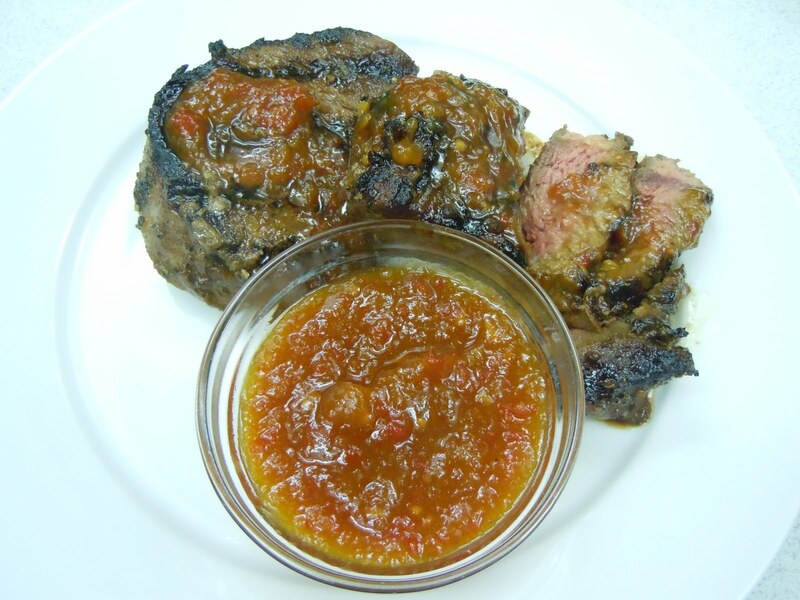 Prepare salsa: arrange oven racks in center and top half of oven, and preheat oven to broil. Trim about 1 inch from tip of corn to form a flat end. Place corn on baking sheet and transfer to top oven rack. Broil, turning once, until kernels are brown and blistered, about 18 minutes. Remove from oven and let cool to room temperature. Over a cutting board, stand corn upright on cut end and carefully slice kernels from cob in a downward motion. Transfer kernels to a medium bowl. 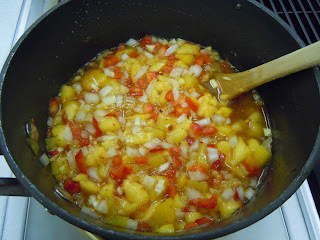 Add cucumber, onion, tomatoes, peppers, zest and juice of 1 lime, oil, cilantro, 1/4 tsp cumin, and 1/4 tsp salt to bowl. Refrigerate until needed. 2. Preheat oven to 425 degrees. Stack tortillas on top of each other and wrap in aluminum foil. Place packet on one side of a parchment lined baking sheet. 3. In a shallow bowl, add flour. In a separate shallow bowl, whisk egg whites, remaining cumin, and 1/4 tsp salt. 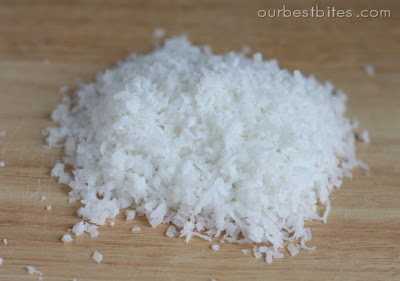 In the bowl of a food processor, pulse rice cereal into a fine powder; transfer to a third shallow bowl. 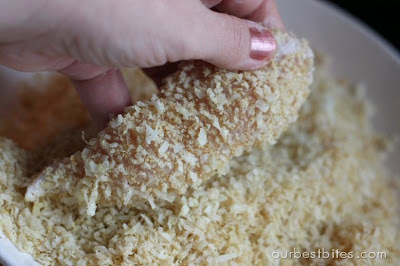 Mix brown rice cereal with panko crumbs. Pat halibut dry with a paper towel. Working with one piece at a time, coat each strip in rice flour, then egg mixture, and finally the rice cereal/panko mixture. Arrange strips in a single layer on empty side of baking sheet that you placed tortillas on. Generously mist tops of prepared fish with olive oil cooking spray and bake in center of oven for 6 minutes or until coating is golden and crispy. 4. Meanwhile, in a small bowl, combine yogurt, feta, and remaining lime zest and juice. Set aside. Chop up 1 avocado into small chunks and set aside as well. 5. To assemble tacos, carefully open foil packet of tortillas and allow steam to escape...they will be hot! Lay tortillas in a single layer on cutting board and mix avocado with salsa. Spoon salsa onto center of each. Top each with 1 piece of halibut, yogurt-feta mixture, avocado, and finely shredded lettuce. Enjoy!